You can see the full extent of the nebula in this false colour hydrogen-alpha image and this black and white SuperCOSMOS image. 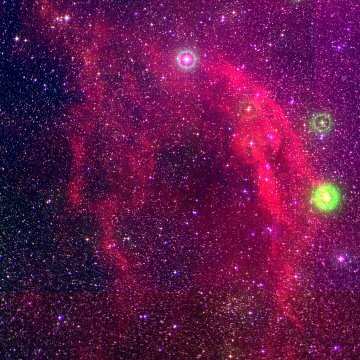 The F8Ia supergiant Wezen (Delta Canis Majoris) is visible towards the bottom of the nebula, but this is a foreground object. Tau Canis Majoris, which may be one of the brightest stars in the Milky Way, is sometimes called the "Mexican jumping bean star", allegedly because of the way it moves around in the eyepiece of amateur telescopes. It is the hottest star within the NGC 2362 star cluster. Radio parallax measurements of VY Canis Majoris give a distance estimate of 1140 (+110/-90) parsecs. . This implies that either Sh 2-310 is closer than usually estimated or that VY CMa is a foreground object.